Get Fit at Home With the Right Workout Room Flooring! More and more people are becoming interested in trying to get in shape. Exercise is something that a lot of individuals are trying to do. It’s not always easy to get motivated enough to make the trek to the gym. And, let’s face it; working out in public can be pretty awkward when you’re staring at bodybuilding, muscular men and women. It’s especially hard when you’re just starting out. If you’ve felt intimidated by the idea of going to the gym, know that you’re not alone. Lots of people opt for exercising in the comfort of home-sweet-home to avoid the discomfort of public workout spaces. Even if you’re quite comfortable going to the gym, it might not always fit into your schedule. The good news is that you can get your exercise on right inside your house. With the proper equipment and space, you can get that heart going and be your best self. But equipment isn’t the only thing you need. You also need the right kind of workout room flooring. So, why is it so necessary to have a specific type of flooring in your home gym? What’s the big deal? Okay, we’re sure that you already know this, but we just need to cover all the bases. Your workout room flooring has to be durable. We don’t mean that it needs to be resistant to scratches and moisture. The flooring has to be able to handle all of the heavy machinery and equipment. It has to be able to withstand as you run and jump on it. Workout room flooring has to be really strong. In addition to durability, the flooring should also be able to support you. Just as your shoes have to be “workout worthy”, providing the proper amount of comfort and support, the flooring should be comfortable and supportive. Otherwise, you could end up doing yourself more harm than good when you exercise. You’re already going to be using muscles you didn’t know you had. Why make it harder by having uncomfortable flooring? If you have good workout room flooring, you’ll make things a lot easier on yourself. Foam – This kind of flooring is comfortable and has a good level of shock absorption. It’s also pretty affordable. However, it’s not the best option if you plan to have a lot of heavy equipment as it can definitely be damaged by extremely weighty objects. Rubber – This is a great choice! It’s durable, long-lasting, and comfortable. It absorbs sound so it’s great for those early-morning or late-night workouts. Rubber is, however, a little on the expensive side. Turf – Turf flooring looks amazing and is extremely durable. But, it’s definitely pricey. Vinyl – Talk about durability! Also, vinyl flooring is fairly comfortable and can give you the look you want in your home gym. But, it doesn’t provide much shock absorption and it can be damaged by your heavier equipment. Gym Carpet – Good old carpet seems to always be there for us. It’s comfortable and fairly durable. But, it does hold moisture so it needs regular cleaning to prevent mildew problems. Of course, there are pros and cons to each of these options. You’ll have to decide which one is best for you depending on your needs. 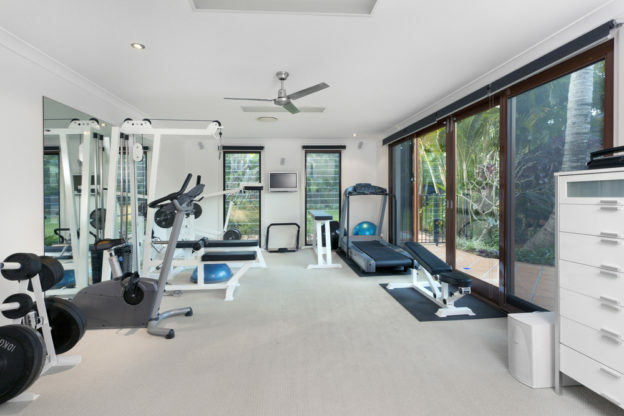 If you want to convert a room in your house into a gym, you’ll need to get the right kind of flooring. But, first, you’ll have to get rid of your current floors. That’s where DustBusters Floor Removal comes in! Contact us today to let us get you started on your way to a healthier version of yourself!